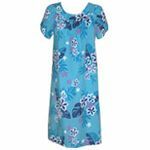 Red Hibiscus Fern Hawaiian MuuMuu, (Kaftan / Caftan), Pull-Over House Dress with Petal Sleeves, pocket, Regular Sizes and Plus Sizes is Available in Beige and Blue. Free Standard U.S. Shipping at Checkout! Offering Authentic Hawaiian Dresses in regular & plus sizes since 1953. There are no universal size standards in the apparel business. One manufacturer’s large is another manufacturer’s medium, etc. These measurements, shown in inches, on this size chart, pertain to R. J. Clancey MU'U MU'U Dresses, and have no relationship to any other dress maker or brand name. To avoid returns or exchanges, please call the Toll Free Number, 10 A.M. to 3 P.M., local Maui Time, if you need further assistance with your size: (1-866-628-4626). BUST or CHEST measurement is the circumference measurement taken from below the armpits from seam to seam. The measurement is taken with the dress flat on a table. Gathered stitching at yoke allows for slightly more bust room. The WAIST is a circumference measurement of the middle of the dress. The middle of the dress is half-way between the shoulder top and the bottom of the dress. The BOTTOM is a circumference measurement of the bottom of the dress taken from seam to seam. The LENGTH is measured from the shoulder top to the bottom of the dress hem.